The recent weeks have kept me quite busy getting the annual Ice Fishing Derby in Merritt, BC organized. Yesterday I filmed a public announcement for the Fishing Derby that is aired daily on Shaw Channel 10 broadcast in the Merritt Thomson area. All this activity had me thinking more then usual of ice fishing. The truth is that I am more a summertime fisher while the spring, fall and winter are my hunting seasons. In response to the Ice Fishing Derby I received quite a few emails from people asking me all kind of questions, from what to bring to how to fish on the ice. In an earlier article here on the BC Fishing blog I addressed ice fishing safety and other useful tips. In this article we will look at tactics and lures that work well on trout and other fish commonly fished at Mamette Lake, where the Derby will be held. The Mammette Lake, despite its size, is quite shallow with a maximum depth of only 14 meters (45 ft.). The lake offers fair fishing with the main species being trout and burbot. All burbot have to be released. The average trout are around 0.5 kg (1 lb) but can reach up to 2kg. (5 lb.). The larger fish are in the deeper areas to the northeast of the lake. Ice fishing tackle can be simple, from a small sensitive ice fishing rod to simply holding the fishing line in your hands. The important aspect here is that you can feel the fish. In the winter fish are not nearly as aggressive as in the summer. This means that you often will not feel when a fish takes the bait with normal fishing tackle. The size of the hole in the ice depends largely on the fish you’re after. For trout and trout sized fish an auger with a 12 cm ( 5”) to 15cm (6”) diameter will do just fine. What type of auger you use is up to you. A gas driven auger is faster and requires less strength but they are expensive. A manually operated auger requires strength and takes a little longer to drill through the ice but at around 50 to 60 dollars they are affordable. Fishing through a small hole in the ice does not leave you with many options in tactics. One tactic that can work very well is what I call “bouncing”. I let the lure or bait sink quickly to the bottom of the lake where it will "bounce" off the bottom. The noise this creates can attract predatory fish that are by nature very curious. This tactic also works by letting the lure or bait bounce off submerged structures, such as wooden logs and rocks. Once the lure is bounced I generally let it sit for a while before I retrieve it slowly in a twitching motion. The twitching imitates a live food source and that might be all that is needed to get a lethargic fish to move in and take the lure. Another very successful method is jigging. Jigging a lure gives the impression of an injured baitfish. For this I let the lure sink to the depth to where the fish are and then retrieve the lure quickly a few inches, then let it sink again and retrieve again. This makes the lure move in a erratic pattern to which predatory fish are attracted. Predatory fish are attracted to two things. Sparkle and noise. Spoons like the Bay de noc Swedish Pimple or any of the many quality spoons made by Gibbs Fishing Lures in British Columbia. Other lures that work well are things like the wedding band and other sparklers. 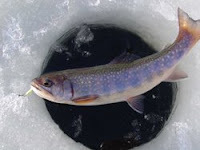 Jigging lures with plastics or real bait are an old and reliable ice fishing lure and should have a permanent place in any ice fishing tackle box. Of course, I keep always one or two of my favorite Rapala Lures handy and that is no different when I go ice fishing. Rapala’s Jigging Shad Rap or Jigging Rap are always close at hand on the ice. If the truth be known, I rather would forget my rod at home then go fishing without a Rapala lure in my tackle box. For me, if nothing works, Rapala always came through and saved the day. Hope to see you all at the Merritt Ice Fishing Derby on January 18 until then, Tight Lines...and don't forget to have fun! Thanks for the fishing tips on ice fishing. I am still waiting for the ice on my favorite lake to freeze up. Should be soon, and, then I can put your tips to use.